Delete will delete the currently selected item in the Object Tree. The command will change its visibility based on selection in object tree. 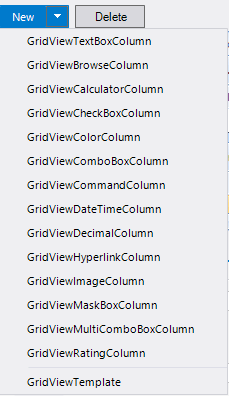 It is not visible when RadGridView is selected from the Object Tree. This section shows a preview of the GridView and how it will look on your form at run time. Data is not shown for performance reasons. All GridView operations (grouping, sorting, column reorder, etc.) are allowed and will be persisted on the form once the Property Builder is closed. The Preview also shows in real time all changes made through the Properties and Settings section, Object Tree section, and the Command bar. In this section you can edit properties and settings of any item, selected in the object tree. The Properties and Settings are contextual, depending on the object selected. 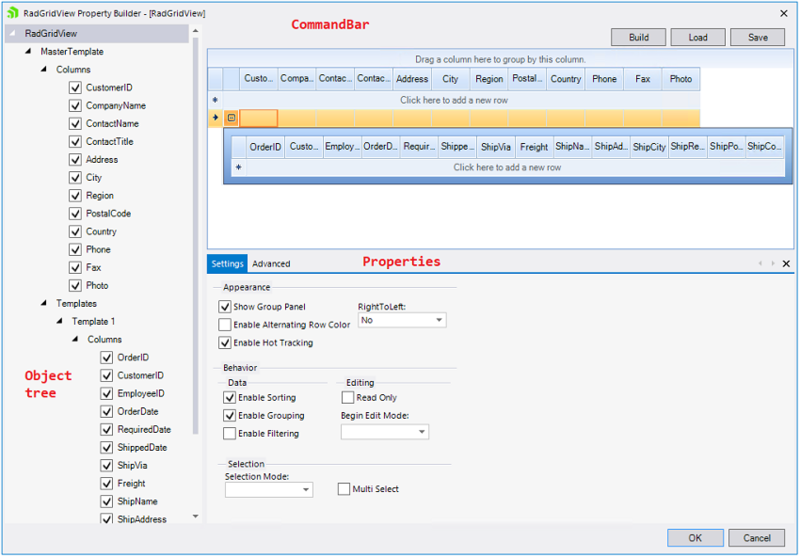 The Settings tab shows the most widely used commands, where as the Advanced tab contains all properties of the currently selected item. Delete existing columns/templates by selecting the needed item, and hitting Delete in the command bar.